This page: Sunrise, Colorado Fuel & Iron Company. Saint Peter don't you call me cause I can't go. Sunrise is a company town in the fullest sense. Everthing, and may it be said everybody, is owned by the Colorado Fuel and Iron Company. No special brand is necessary, for the fact impresses itself indelibly on all who come here. Visitors are not especially welcomed, which a glance at the passenger accommodations on the train that meets the Colorado & Southern at Hartville Junction forces itself on all comers. 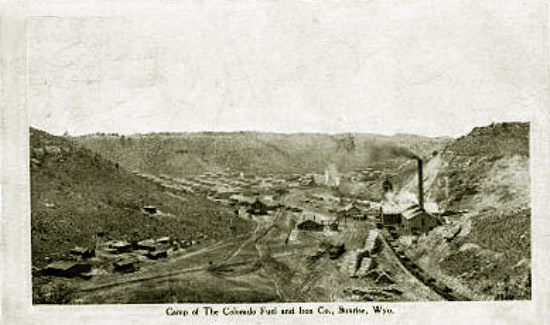 From Hartville Junction the spur to Sunrise via Guernsey, a distance of about fifteen miles, belongs and is operated by the Colorado Fuel and Iron Company. It is a fine piece of railroad engineering with its high grades and frequent curves and one would not mind paying two prices for transportation, as he must. If only the accommodations were adequate, but, as has been said, the company seems not to care for that sort of traffic. Having constructed the line for its own convience, no doubt it considers itself an accommodator of the public by attaching a caboose to its trains of ore cars, which caboose has poor seating capacity for about eight people, through several times that number travel over the route as a rule. [T]he employees were forced not only to depend on the favor of the Company for the opportunity to earn a living, but to live in such houses as the Company furnished, to buy such food, clothing and supplies as the Company sold them, to accept for their children such instruction as the companies wished to provide, and to conform even in their religious worship to the Company's wishes. Report on the Colorado Strike, p 55. At the time of the Ludlow affair the minister was very outspoken in his criticism of the coal companies, but seemed to regret his action when informed of the facts concerning that disturbance. He has socialistic tendencies, however, and I have been informed that his wife is a Greek, yet they may both be perfectly honest. In actual fact, the Reverend McCorkle while at Missouri Valley College, organized a chapter of the Intercollegiate Socialist Society and, according to the Montana Historical Society, remained a lifelong member of the Socialist Party. In 1915, The Reverend McCorkle testified before the Commission on Industrial Relations. In 1916, he was elected as moderator of the Cheyenne Presbytery. 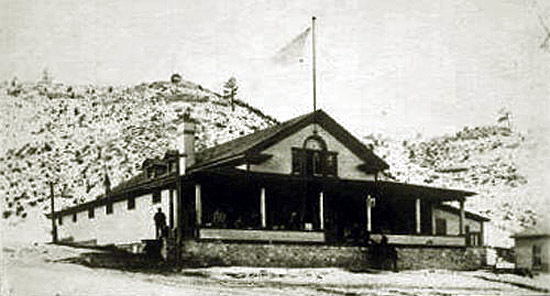 In 1917, due to his wife's failing health, he returned to Montana where he had previously worked as a miner at Bearcreek. 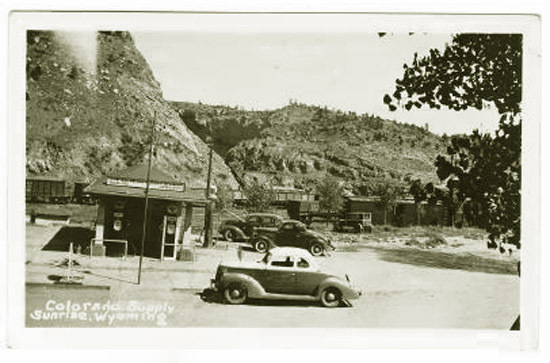 In addition to Missouri Valley, The Reverend McCorkle had a master degree from Columbia and attended the Union Theological Seminary.
. Colorado Supply Company, the Company Store at Sunrise. 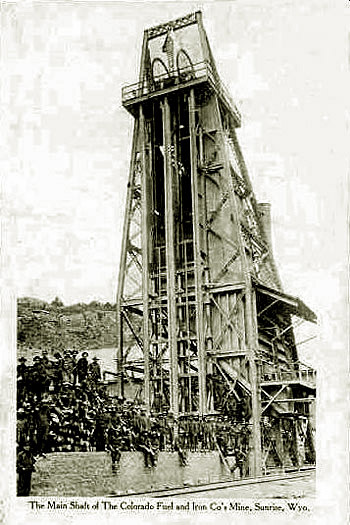 The first mines the "Glory HOle" and the "Chicago" were open pit mines using large steam shovels. 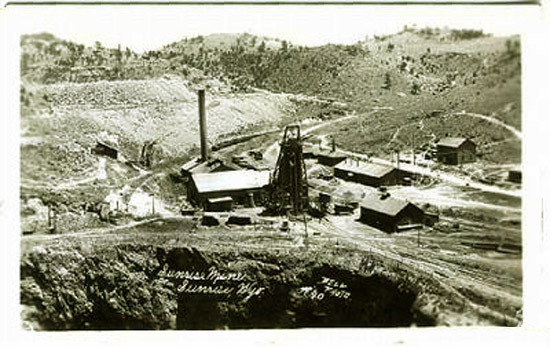 By 1902, the Company also opened underground mines. 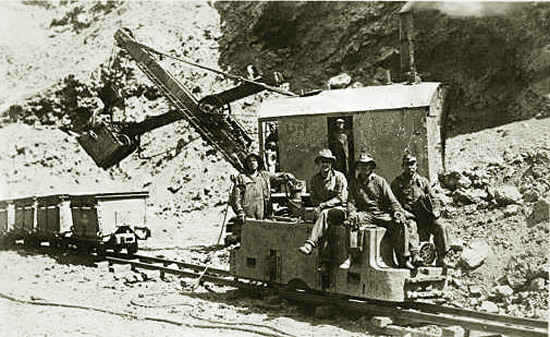 Surface mining was discontinued in 1941. Sunrise as a town was founded in 1899. At first, the town had the same miserably conditions as company towns in the various coal camps. It had thirty-eight wooden four-room houses and a boarding house for single men. 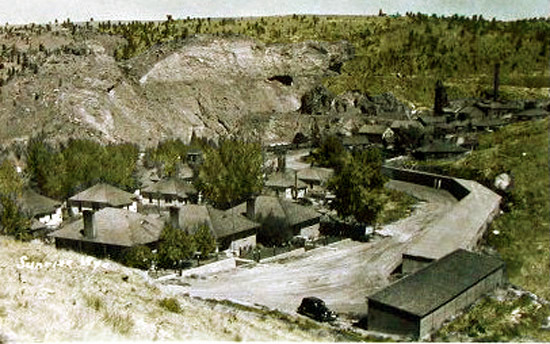 Folowing almost universal condemnation of Rockefeller as a result of the Ludlow Massacre, Sunrise was made a model town. Houses were improved. In 1917, a YMCA was constructed. 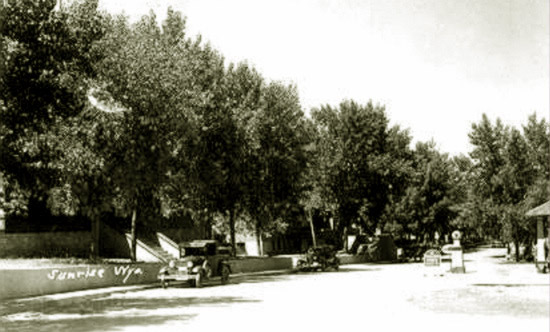 The building had a bowling alley, and combination gymnasium, auditorium and moving picture theatre. Colorado Supply Company gas station, railroad tracks beyond, Sunrise, approx. 1938. Railroad tracks, Sunrise, approx. 1938. 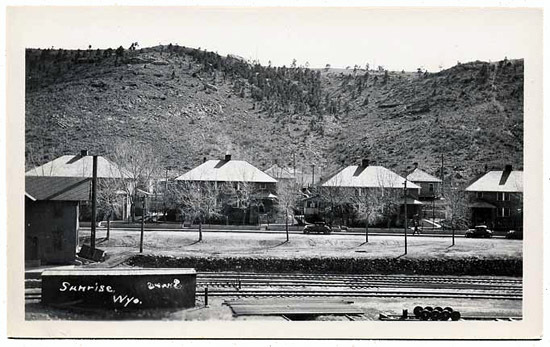 The two-story houses were for company managers. The Rockefeller interests remained in control of CF & I until the 1944. The company began a program of diversification. 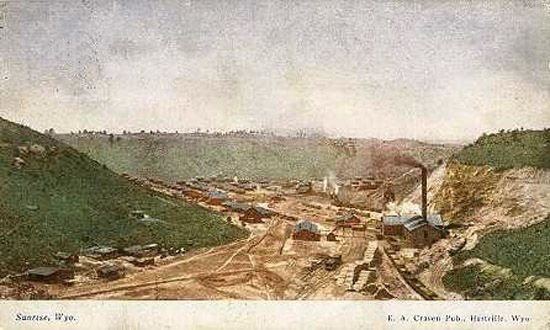 All mining in Sunrise was discontinued in 1980. In 1990, the company filed for bankruptcy. Sunrise, which at one time had a population of 1500 and was the third largest source of iron ore west of the Mississippi, now is a ghost town. The wooden houses have all been removed. Surviing are some of the brick structures constructed during the modernization. As of 2009, the town was for sale.